Just starting out with your hand balancing training? Wondering how long will it take you to master the freestanding handstand? Take a look at this video for instant motivation and to get a rough estimate of how long will it take you to achieve this move. To fasten up your progress and reach a stable 30-second freestanding handstand as fast as possible, check out one of my best selling courses here. I often receive questions on basic handstand moves and drills from people who are just starting out with their hand balancing training. The following video contains three quick and effective drills for those looking to achieve their first freestanding handstand gradually. And you can practice them anywhere! Already able to perform basic hand-balancing moves? 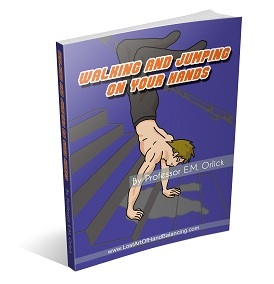 Click here to learn how to walk and jump on your hands. Another lead-up drill for Straddle Press Handstand is One Leg Press Handstand, a drill #7. As you can see, in this drill you’ll kick-up into a freestanding handstand while lowering only one leg and keeping the other one in the air. By staying in that balanced position, you’ll increase your dynamic flexibility. Initially, you’ll only be able to lower one of your legs just a bit before coming back up. After a certain amount of practice you’ll succeed in touching the ground with that leg and come back up without the kick-up. As you can see in the video, that bottom range of motion is still a bit difficult for me and I had to use little momentum in order to come back up. Even though I only started practicing this drill recently, it’s a great one. By using only one leg, you’re basically learning to control your entire bodyweight in that dynamic manner, which is essential for performing the straddle press handstand.